Dessert’s Bar is all about sharing healthy food & dessert. 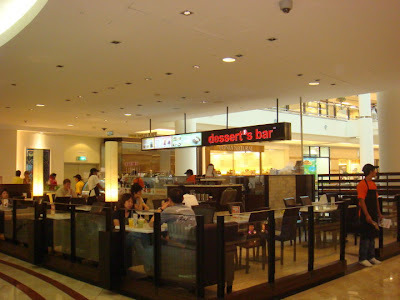 Their menu consists of cakes, ice-cream & sorbet, assorted dessert, smoothies, wraps & sandwiches, pasta and lots more. They make sure their products are free from nasty things like artificial coloring, flavoring & preservatives. Their outlets are made for you to hang out & enjoy a great dining experience; good ambience, food & service; be it for leisure or work, they are Wi-Fi friendly too. What’s more, you can find them out of their outlets from time to time – in road shows, events, home/corporate catering & many more! During fasting month dessert’s bar came up with 3 new meals specially catered to appeal to the Raya festival. 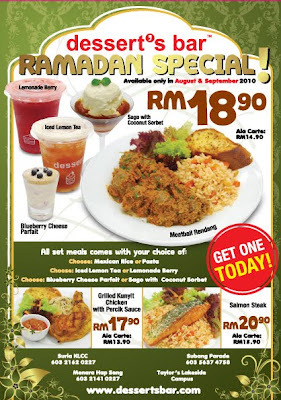 These meals are available from August till September 2010. Available only at their branches in Suria KLCC, Subang Parade, Menara Hap Seng and Taylor’s Lakeside Campus.